This is the first step on the long road to relevance. We declare our mission. We’re going to document the overlap between our business goals and the needs of our audience. 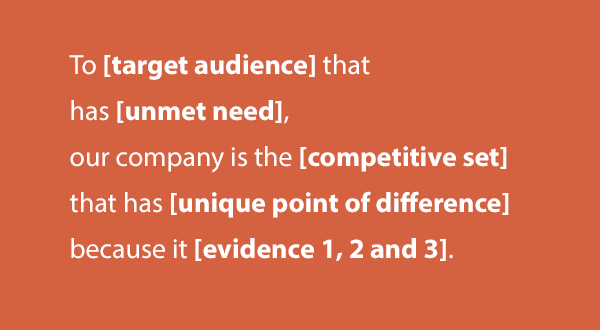 This little bit of text is our content marketing mission statement. This is where we’ll take our stand. It’s the cornerstone of our content strategy. It states what we’ll be publishing, who it’s for and why they’ll care. Our content mission will support (or reject) every action we take in our content. Not sure about something? Check the mission. If it doesn’t fit, leave it out. Documenting our mission statement is surprisingly simple, but most content marketers haven’t done it. To make it easy, here’s our content mission template. All you have to do is fill in the blanks. Fill in these blanks before creating any content. Let’s take a closer look at X, Y and Z. Then we’ll review mission statement examples and two other templates for marketing statements. That larger audience of people who are interested in our content can drive huge, indirect benefits. This includes a world of potential visitors, followers, subscribers and influencers. Without this second audience, we are unlikely to attract enough of that first audience to create steady demand. These are the topics and formats that we will publish. It is the overlap between the topics that we know and can teach, and the topics that our audience wants. When we share this expert knowledge, we pull our audience toward us. Great content marketers publish an endless stream of blog posts. It has to be helpful. Our content will be useful, or, at least, entertaining. Our mission must name the specific benefits that our content offers our audience. If there is no benefit to them, we won’t win their attention, we won’t attract visitors and we won’t generate any demand. How does this help them? What task can they complete once they are finished reading this? Should We Publish Our Content Mission Statement? Yes. This is the promise we are making to our audience. There’s no reason not to share it publicly. The Orbit content mission is right there at the top of this blog. Just having a documented mission makes a difference. 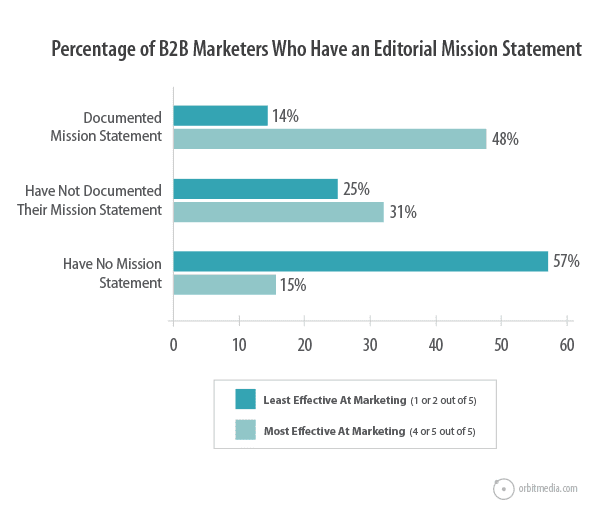 According to the 2015 B2B Content Marketing Benchmarks, Budgets and Trends, marketers who document their editorial mission statement are much more likely to consider themselves effective in their content marketing. Here’s how it correlates with marketing success. Brands that have a documented content mission statement are three times as likely to say they’re effective at marketing. 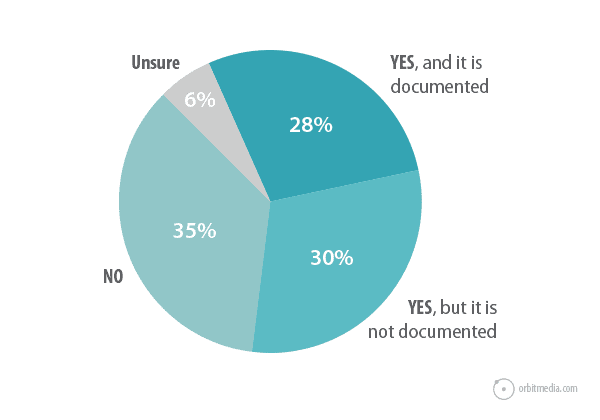 Still, only 28% of marketers have theirs written down. Here are some examples of content marketing mission statements for both B2B and B2C companies. Notice that although they don’t all follow the template exactly, each mission names the audience and the benefits they receive when they consume the content. Working Moms Only: To Supply the tools that can give every working mom the ability to lead a healthy, wealthy and more balanced/blended lifestyle. Digital Photography School: A website with simple tips to help digital camera owners get the most out of their cameras. Home Made Simple: Enable women to have more quality time with their families. Indium: Help engineers answer their most challenging industrial soldering questions. Inc Magazine: The place where entrepreneurs and business owners find useful information, advice, insights, resources and inspiration for running and growing their businesses. Private Equity Firm: To provide clients, prospects, intermediaries and investors with industry, market and economic insights, original research, and financing strategy stories and outcomes to help them make better decisions about corporate and project financing. Here are three more statement templates we can use to keep our marketing on track, from the big picture to the small picture. Our content marketing mission statement is specific to our audience and our content. Our marketing positioning statement (also known as a value proposition) describes our place in the market. I highly recommend using Susan Silver’s marketing positioning template to sharpen the focus of your marketing in general. Put simply, this describes why we are in business. How we fit into our market. Fill in these blanks before doing any marketing. The target audience should be as specific as possible. The unique point of difference explains how we are unique from the other businesses in our competitive set. The brilliance of this template is that it forces us to name the unmet need our business fulfills and how we are uniquely position to do it. Then we have to back it up with evidence. These are the reasons they should believe our claims. Don’t go to market without evidence. To people who have friends with cancer, who are in financial need, who want to help them in a meaningful way, GiveForward is the online medical fundraising tool that empowers people to help their ill friends financially. 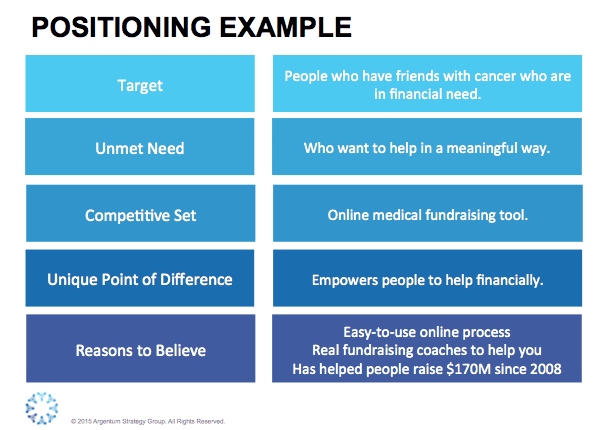 It has an easy-to-use process, real fundraising coaches to help and has helped people raise over $170M since 2008. The marketing position statement is general to the entire business, not specific to content. And it’s typically an internal document; it isn’t made public or posted online. Here is a mission statement template that goes one level deeper. Meghan is pushing us to define our content and outcomes more specifically. 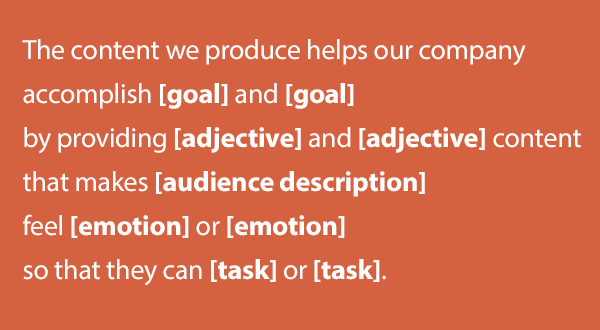 The final step in this template is very powerful since it forces us to name the actual tasks that our content will enable our audience to complete. 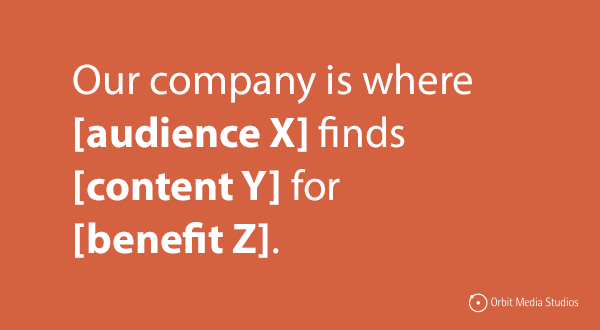 Fill in these blanks before going deeper into content marketing. At this level, it gets easier. 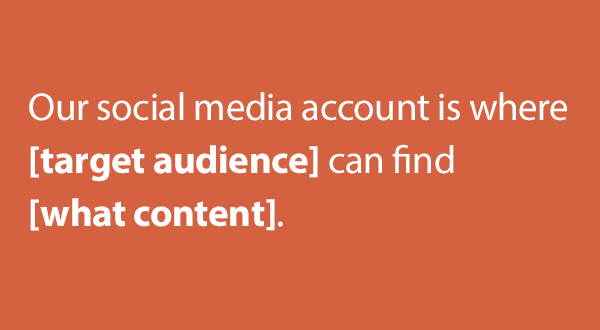 Social media falls under content marketing, so this template will look familiar. Our social media mission is a subset of your content marketing mission. Laura encourages marketers to document their mission for each social network since different content may be shared on different networks. Filling in these two simple blanks for each social network you use will guide us in what to share and how to engage with each community. Is it inspiration? Share quotes. Is it educational? Share links. Documenting this will help us stay on topic. Fill in these blanks before becoming active within a social network. The road to success is littered with burning wrecks of marketing campaigns that targeted the wrong audience, created the wrong content or tried to build relevance in an irrelevant social network. It takes less than an hour, it correlates with success and it’s the best way to avoid a marketing disaster. So before we start a blog, let’s put ourselves on a mission! By using CRM tickets as the foundation for many of my blog posts it’s easy to resonate with the audience. But isn’t it important to know who you’re talking to and what you’re talking about? You alluded to this in your comment, “looking for answers that are entertaining.” That’s part of a mission statement. It differs from my own. I don’t think anyone reads this blog for entertainment value. But certainly there are a lot of marketers who get traction by adding some fun to their educational content. I’m sorry to hear you don’t see value in creating a mission statement. It’s really not complicated. Creating ours just took a few minutes and it’s helped us stay focused. I highly recommend taking the time to jot this down, Mitch. I would also have to add that people don’t know it’s a “mission statement” but they do know, when they reach our blog, what they’ll get. It’s helpful to our readers and, as the blog editor, it’s helpful for me when people want to write for us. Those are our guidelines if anyone wants to blog for us. Getting back to being an old guy for me it’s all about if you going to talk the talk you need to walk the walk and six words are not changing anyone’s mind. By the way company that I worked for in the 80s (1/2 billion in annual revenue) had just installed the new CEO whose mission statement was “Change or die” yikes! Do I need to have the words carved into a piece of granite like Hal did in the 80s sitting squarely on his desk – obie one? For the record, I find this blog entertaining. I think is is awesome advice. I enjoy the clarity and practicality of this, and the other 2 SEO blog posts I stumbled on. While they are two years old, I got more out of this than courses I paid for! Maybe it takes a while of stumbling around in the desert to appreciate the oasis when you find it. I’ve got my templates and getting to work! Great post Andy, very helpful for turning a brainstorm into a plan. This is an uncannily timely piece for me. Quite helpful. 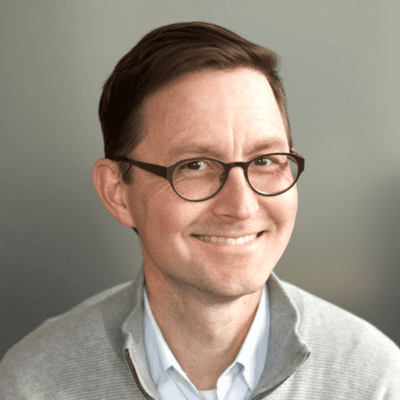 Great post Andy, and arguably more helpful to content marketers than their audiences, although if it’s helpful for the marketers, the audience ultimately benefits even if they aren’t aware that there is a content mission statement in place to begin with. I’ve been thinking about exactly this topic! Agreed with Don that this post is uncannily timely. Really helpful examples and frameworks here, thank you! It’s so funny because after taking a course on Coursera I was thinking let me go back to my marketing strategy and drill down to the point where I had a mission statement for each social network I was going to use. When I first started I was thinking this was too tedious but once I finished which only took a day to complete. Every posts and piece of content Not only felt more meaningful but I could see more responses from my audiences because each piece of media fit into the overall strategy and took them from consumer to immediate advocate. And I thought am I the only going this deep and maybe I’m over thinking what my strategy needs to entail. Glad I’m not the only one and I see effective and important going this truly is now. It seems there could be several different business goals, so I’m wondering how that wraps up into single content mission statement? Hi Andy. Template No. 2 needs to be attributed to the original author – Tim Calkins from Kellogg School of Management. Tim mentions this template as the four elements of forming a ‘the brand positioning statement’ in the book titled ‘Breakthrough Marketing Plans” [page 52; year 2008].